Angel gazed up at the sky, tucking her wings in tighter, and growling under her breath at the water that fell from it. Looking back to the panther as she watched Vineda jump from the tree she had been perched in, her words of shape-shifting confused her, not sure of what to make of it she ignored it and decided to question it later. Lighting flashed near them, Angel's tail raised high as she strolled forward toward the tree that the panther now stood under, she liked to watch storms but she wasn't sure she wanted to be out in one. Getting under the tree she sat down a small ways away from Vineda, she wondered why she felt so at ease around a much larger predator, it was kinda confusing her but she brushed it off and spoke in a friendly voice, "I didn't expect the weather to change so fast." Gazing around her, she continued, "This place is so beautiful and peaceful, it seemed like a good place to rest." She grinned slightly and added, "No I don't think I'm lost, but I don't know were I'm going." Cocking her head in question she asked, "What about you?" OOC| Sorry I'm a little late >.< school just started up again and i've been doing some weird sort of dance that's probably similar to the hokey pokey with getting my schedule straight, and i'm super tired so it might sound a little loopy. BIC| As the wind picked up slightly, Vineda watched small leaves and bits of debris twitch and sway in the breeze. She shrugged slightly at this other and couldn't help but notice the red of her coat, bright in the darkness the sky had brought in. Throwing wary glances at the sky, she had to wonder if the same rules about standing under trees in a storm with lightning applied in these lands. Perhaps they should seek shelter, but she didn't really know of a much better place. There were a few birds nestled in the very heart of the tree, though, so she hoped it was safe to assume their instincts were a bit more attuned than her own. "Yes, it sure blew in from nowhere. Elemental influence, perhaps. Then again, maybe not. I can taste no magic in it, but that doesn't always mean much. And yes, it certainly is beautiful here. Not such a bad place to be lost if you ask me! And not knowing where you're going makes it an adventure!" She answered with a grin of her own, adding a low growl as thunder sounded in the distance. It rolled slowly closer, powerful enough to make the ground shake a bit under her paws as it reached directly above them. Claws subconsciously appeared and dug slightly into the ground. Picking back up where she left off, Vineda continued. "Oh I haunt this place often enough. I am bonded to one native to this place, and I cannot bring myself to stay away from it for long, we both loves it so. It is quiet here as of late, but there are sometimes many others to be found in this land. Of all sorts," she added with another grin. She was following the storm and the scent and feel of damaged life, more than likely a tree struck by lighting. It was rare for storms to cause any real damage here; for that matter, it was rare for there to be a storm that was anything other than nourishing and healing. Songhue, as she was known in these lands, had been spending quite a bit of time in her sylph form, a very miniature, glowing creature that at first glance looked quite a bit like an average, blue-tinted lightning bug, if such blue things were average. Small though she was, if someone looked, they could see a bit more complex of a creature, a humanoid shape with delicate wings, a wisp of a dress and small, pointed ears. It was one of her favorite forms and, at least recently, one of those she found herself most comfortable in. Traveling in this weather in such a form wasn't the easiest thing to do, all the same. She admitted defeat with a sigh as she reached the damaged tree, landing on one of the scorched roots as she noticed others a good ways off. At least it seemed a great distance in such a small form; as she shifted back to her fae form, the one best known here, the others seemed much closer, and in fact one had a familiar face. Hadn't she seen that feline before? A smile touched her lips at the thought. Yes, she had definitely seen that feline before. The other was a stranger, though, new blood to this land. Resting a hand on the roots that had been damaged by lightning striking so very close, she hummed a soft, soothing tune as the storm came in earnest, the first drops of rain heavy and promising quite the shower. The tree seemed to move of its own accord for a moment, as if relaxing while the damage was healed and its thirst was slackened. The storm had changed in feel by the time she stood. Thunder still galloped across the sky, lightning still sparked as it played, but it seemed to be nothing more than a show, the elements enjoying themselves. Songhue was reminded of the great sky horses from her home lands, massive winged beasts that would race with these storms. Their hooves had crashed as the thunder, sparking as they bucked and played, bringing the first play to the storms there. The winds had been caused by the sway of their tails and manes, breezes that felt like silken, sky-woven tails brushing against the skin. The memories made her smile. The lands she had created, a realm in their own right, had helped a lot in reaching the point where she could smile from these memories. The land of Sunlit Shadows was her home now, the lands where she and her Serians lived. 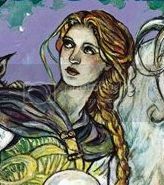 She had found some of the sacred sky horses and offered them sanctuary, as well as other creatures of old, and her family had grown once again. She had the memories, still. Now, thanks to her bonded, she had a new home as well, somewhere she belonged. Ah, but she was waxing philosophical now. That must be why she had been favoring her sylph form. Chuckling at herself, she stood as the storm quite effectively soaked her, ignoring the way her gown stuck to her curves or plastered her hair to her cheeks. Droplets glimmered on her wings, laying thick in her lashes as it rolled down her skin. She had to be quite the silly sight, yet she found she didn't honestly care. She was in good company, in the birth land of her Serians, their own original home before they made their new one, together. "Merry meet, friends. How fairs thee?" Being feline in such weather was a bit of a drawback, as she found the growing raindrops displeasing in their unpredictability. Had she waded across a stream she would have gotten wet by choice, but being caught in a rainstorm was a different matter entirely. Knowing how alarmed others could be if she gave no warning, she backed away a few steps and let her new foxy friend know in advance she was going to change form. "Panther though I am now, human I'll soon be. Please do not be alarmed, for I am still me." As her singsong rhyme ended, she let herself flow into the form she recognized from an old life. An old friend had told her it merely looked like a candle flickering in the blink of an eye hen she shifted, though as she did so her mind found a place untouched by time. As far as she knew, the shift could have taken a second or even a day. Looking out through inferior human eyes once again, she sat down quickly. She was very aware of how very silly she looked in the crouch that looked so graceful and natural in her panther-skin. Her slower human mind also registered a most welcome and familiar undertone.. something in the air, or perhaps the earth that she was only just beginning to be aware of. Red-brown hair that hung in damp bunches swayed as she turned her head in search of a friend, and a smile lit her face as the familiar voice allowed her to pinpoint the speaker's location. "Songhue! We meet again, my dear! And in another rainstorm... though this one is a bit more noisey." Her slight nod up at the sky was met with a deep and rather low grumble, and her eyes twinkled in response. The hair at the back of her neck stood up from the storm, but she reveled in it nonetheless. Standing up, she beckoned to the red fox, wanting to introduce a new friend to an old one. "May I introduce you to another of this land? Angel, this is Songhue, Songhue, Angel." An impish smile showed how pleased she was to be here, at this moment, greeting new friends and old... and in a thunderstorm, no less! Sitting by quietly Angel nodded her head in agreement, rising from her sitting position and shaking her crimson tinted fur scattering rain droplets off her coat as she did, wondering to herself what Vineda meant by her bonded. Guessing she would find out in good time, she sat back down her ears twitching slightly at the sound of the wind and thunder around them, but she could tell the worst of the storm was over, all that was left was the noise it could make. Spreading her wings and giving them a good hardy shake to beat out any water that had gotten between her feathers, she spoke in a happy voice,"Hmm..sure is finicky weather, looks to be clearing out already." Gazing up at the still cloudy sky, her eyes narrowed as she rose, her nose in the air trying to pick up a scent of a nearby rabbit or anything else she could catch and make her late lunch. Stretching her front legs out and lowering herself to the ground sniffing at a plant that rested there, glancing back at Vineda she said, "Wonderfully peacefully and magical this place this may be, but I can't seem to pick up the sent of anything to eat, do you know of any good hunting grounds?" So in-tune with her tasting of the most air around them she was that the she didn't at first hear Vineda speak in soft singsong voice, lifting and turning her head her ears perked up at the new scent that now filled the air,a human now stood before her, growling slightly and raising her tail halfway, her mind registered Vineda voice. Her wings trembled with fear and her eyes turned fierce, there was nothing she was more afraid of then a human. Memories that she had long sense pushed into the furthest places of her mind slammed into her like a large, hard stone. All these feelings happened within a split second of one another, quickly recovering, forcing herself to relax her tense stance, her eyes still burned deep within the deeps with fear. Taking a few steps back but forcing a smile, her eyes swiveled over to the small glowing creature, lowering her tail in respect to the small one she replied, "It's good to meet you." Suddenly there was a flash of lightning so loud and bright that everyone below was startled in excitement. Up above however was another matter. Waterlily was enjoying a nice flight when he flew right into an approaching storm. That sudden strike of lightning happened to nick his wing and he started to descend. Without his left wing, he started to spiral faster and faster. Screaming like a small child, and heading straight for this circle of rocks below, he manages to pull up at the last moment, shrieking right past some creatures and smacking right into the stream.